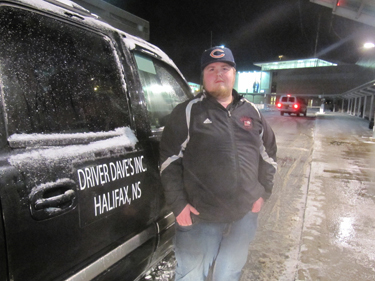 A shuttle service run by a Dal/King’s grad is in danger of being shut down. Dave Wolpin’s airport shuttle service — Driver Dave’s — will go before the Utility and Review Board on Tuesday. The hearing is to determine whether or not Wolpin’s application for a Motor Carrier Licence will be granted. If successful, the licence would allow Wolpin to legally operate a 14-passenger van within the Halifax Regional Municipality. But taxi and limousine companies are opposing Wolpin’s application. Wolpin believes it’s because he poses too much competition. “How are these laws so monopolistic that I’m not allowed to enjoy the free market that we live in? It’s not so free,” he says. Any business which holds a Motor Carrier Licence already is able to object to the granting of a licence to a competitor. Since limousines can seat more than nine people, they can object to Wolpin’s application. A group of taxi owners and operators, Coach Atlantic Group, V.I.P Limousine and Taxi Services, and Prestige Limousine and Taxi are opposing Wolpin’s licence. In letters addressed to the Utility and Review Board, the opponents argued there is insufficient demand and Wolpin is attempting to circumvent the regulations. “With the downturn in the economy, the market will not support another vehicle of this type,” reads a letter from Steve Pace of V.I.P Limousine and Taxi Services. There are approximately 1,000 taxis within the HRM and 204 licensed to pickup and drop-off at the airport. But Wolpin says the demand for his service is there. Since he started Driver Dave’s in early 2010, Wolpin’s team has driven more than 7,000 customers and logged more than 40,000 rides. He’s even compiled a petition of more than 1,000 signatures in support of his service. Tim Auld, a taxi owner and operator, says the opponents hope to prove in the hearing that Wolpin’s business is illegal. “He’s trying to sneak in the back door as an unlicensed individual. He’s doing taxi business and he’s not a taxi,” says Auld. Wolpin currently holds a Commercial Van Licence, which allows him to pick up and exit the municipality, or pick up and enter the municipality. Wolpin found out a year later he couldn’t pick up and drop off within the municipality. For example, he can drive a student from Dalhousie’s Howe Hall to Acadia, but can’t drive from Howe Hall to the airport, because the airport is still part of the HRM. Auld says Wolpin’s business raises issues of passenger safety and doesn’t follow established rules in the transportation industry. Taxi drivers undergo criminal record checks every year. Wolpin’s drivers do not. But Wolpin points to a different form of passenger safety — more than 1,000,000 kilometres driven and not a single accident. Auld says students have misconceptions about cab pricing to and from the airport. For example, for a group of five people Driver Dave’s charges $20 per head. Auld says for a group of five people in his minivan, it’s $63 and another $7 for the minivan charge. It’s a saving of approximately six dollars per person. But for individuals looking for a lift, Driver Dave’s is the cheaper option at $30 a seat, compared to around $63 for a cab. Carly Barrington, a third-year Dal student, thinks $63 is too much to pay for a ride to the airport. Cody Lockett, a fourth-year Dalhousie student, thinks cab fares are reasonable. “They’re alright. $55 is a lot better than they could be,” he says. Auld says Driver Dave’s threatens the competitiveness of taxi drivers who also rely on students, especially during rush periods when school is back in session. “The Airporter and all of its predecessors, none of them have ever made a go at it,” he says. But Wolpin isn’t in the business for the money. The fight isn’t just about Wolpin. It’s his team too. Wolpin employs 12 people, many of whom are current or former university students. Stewart says Wolpin has been supportive of his staff through the licensing process. Wolpin has said he would happily step down from Driver Dave’s if someone could beat the service he provides. But he’s confident that’s not going to happen. “Right now, what exists is absolutely unacceptable,” he says. Update: Jan. 22: An earlier version of this story said Wolpin had two 14-passenger vans. He has a Yukon and a Jetta, and the license would allow him to operate a 14-passenger van. The story has been changed to reflect this.